Home > News from Vermont > News from Vermont #372 Believing Never Gets Too Old! News from Vermont #372 Believing Never Gets Too Old! It was recently pointed out that we have not sent out a News from Vermont for quite a while and for that I can only point to that old curmudgeon who writes them being too busy lately! There is a new one headed your way about greasing our farm equipment, clearly not a seasonal topic, so being Christmastime, we feel that you deserve a more meaningful message than one about axle grease! The Magic of Christmas and the Christmas Spirit seems to get even better as I age. Maybe it’s because they’re seasoned these days with more nostalgia. It could also have something to do with our one grandchild, Caitrin, being old enough (almost four!) to really get into this blessed holiday. The other day Betsy, “Baba” to Caitrin, was fretting to Cait about not being able to find that certain dress of just the right color for Cait’s Christmas. “That’s OK, Baba” Cait said, “Santa’s got it.”. And to that, I say “Wow!”. It’s so nice to see young people who still have that instant belief in things magical. We need more of that among the adults of this world! 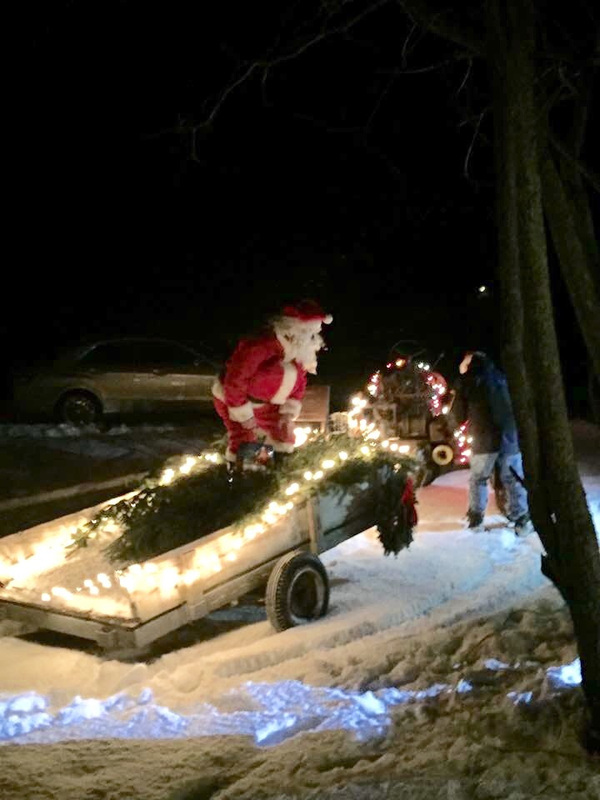 homemade tractor, the “Doodlebug”, to transport Santa to the party. Being a “believer”, and noting the complete absence of any flying reindeer around here, I was delighted to fill in for Rudolph and company. At the appointed time, Mark and I met in the Morse Farm hay barn where Doodle sat waiting. Santa donned his garb and we headed off to the party at Elliott’s where Cait and her two small cousins, Dean and Anthony were anxiously awaiting Santa’s arrival. We coughed and sputtered the short distance (darn good thing we weren’t headed ’round the world!) and “landed” in a prime spot for our entrance. Folks young and old quickly came outside to check out the commotion and when those small children saw Santa, they went totally wild! Mark and I were so excited and pleased to provide those three wee ones with such a happy lifelong memory. And speaking of “happy”, this is the time of year when folks recognize all the good things in their lives and our world…God knows, there’s enough bad things these days. Lest we forget about those good things, this old writer is reminding one and all that “good” is everywhere. Whether America, Europe, Middle East, or anywhere else, all we have to do is look and believe…we’ll find it.